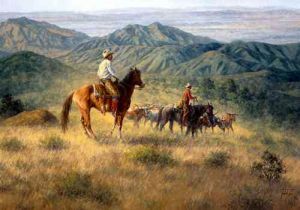 The San Joaquin Mountains of southern California provide a dramatic backdrop for this longhorn round up. Cattle are often hard to locate in this rugged territory. These strays were found hiding in the brush and were directed down the Mountain to join the remaining herd as "The Last Bunch."